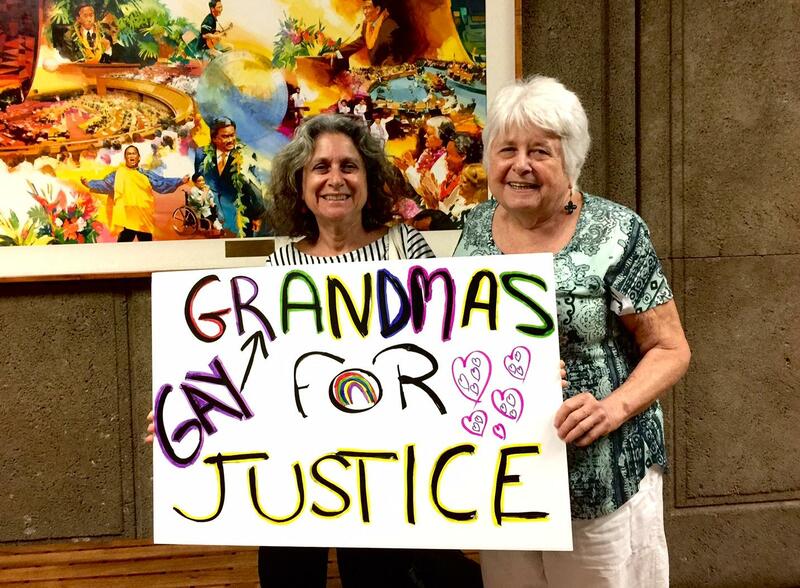 These enthusiastic Grandmas attended a Women's March meeting to plan logistics and create signs. The Women's March, which began with a Facebook post by Maui grandmother, Teresa Shook, has spread like wildfire on social media, attracting nearly 1.4 million marchers world-wide. The national Women's March on Washington has generated images for use by Sister Marches around the world. D.C. organizers were expecting over 200,000 marchers in the nation's capitol the day after President Trump's inauguration. A look at various events planned around the inauguration ceremony of President Donald Trump. “Day of Resistance” activities continue through 2:30 on the UH Mānoa campus and conclude with a march to Trump Tower in Waikīkī. The “Power to the Positive” free concert starts at 7 tonight at the Waikīkī Shell. The Honolulu Women’s March begins at 10 at the State Capitol tomorrow, Saturday, January 21st, 2017. Washington DC officials expected some 8 to 900,000 people in town for today’s inauguration ceremony. Gigi Jones is there---she was Hawai‘i State Director of the Trump for President campaign. Why do you think Mr. Trump is good for Hawai‘i? One hundred twenty eight thousand eight hundred forty seven Hawai‘i people voted for Donald Trump, a third of all voters. They are celebrating. Meanwhile, a "Day of Resistance" is underway at UH Manoa today, and tonight, a free community concert is planned for those concerned about where America could be headed. That’s Ikaika Hussey, guitarist with Jamarek, which means peace, in Senegal. 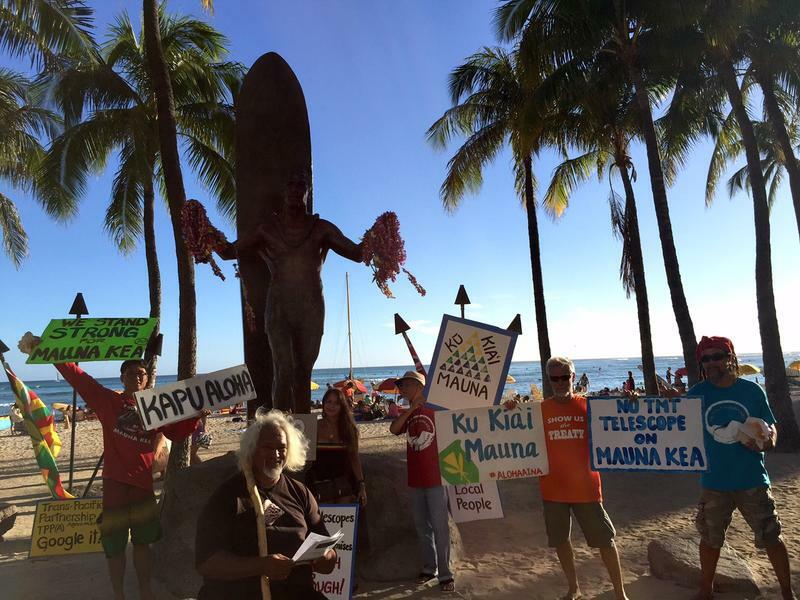 Makana, Taimane, and others, join with the Sierra Club, Hawai‘i ACLU, and more tonight, free, at the Waikīkī Shell. Tomorrow, in Washington D.C., over two hundred thousand people are expected at the Women’s March on Washington in support of healthcare, reproductive freedom, education, the environment, civil rights, and more. Amy Monk is co-chair of Honolulu’s Women’s March, set for 10 am tomorrow, Saturday, at the State Capitol on O‘ahu. “We are a divided nation.” Says Representative Della Au Belatti, Chair of the House Health Committee and a Women’s March co-Chair. There are well over six hundred Sister Marches scheduled for tomorrow around the world, with nearly 1.4 million people participating. 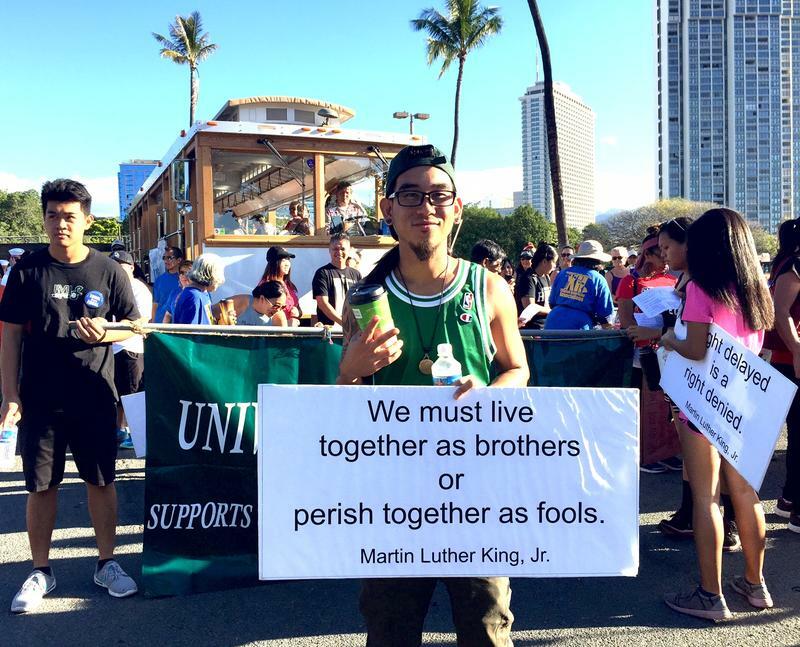 Kaua‘i, Maui and Hawai‘i island also have marches. Permits have been taken out for 1,800 buses to park in D.C. on Saturday; in contrast, approximately 400 buses were registered to park for the inauguration. Word is, motor coaches are booked all through the Northeast and school buses are being used to get people to the March on Saturday. 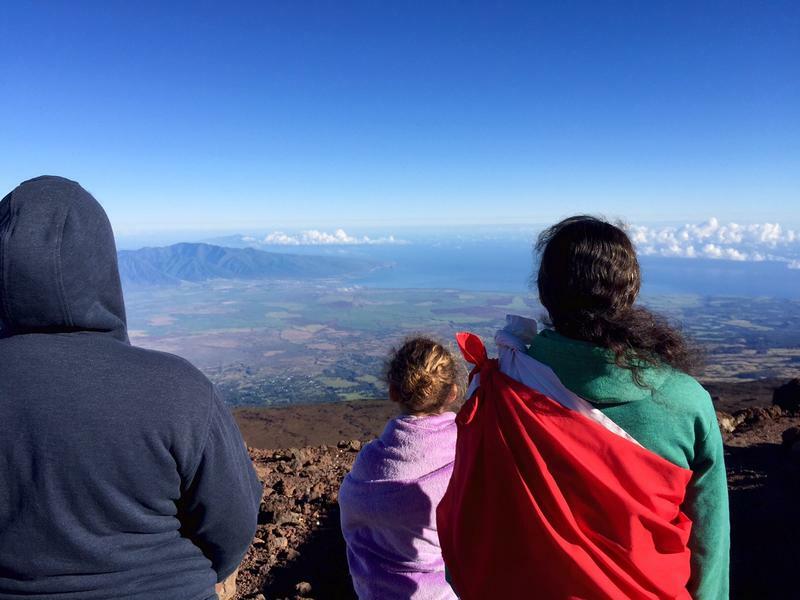 “On my Facebook it’s everywhere, so it’s a really cool, powerful thing to see people wanting to come to the marches across the country,” says Morgan Truby, senior at Hawai‘i Pacific University. On the front page of the national Women’s March on Washington: "The rise of the woman = The rise of the Nation"
In solidarity with the Women's March on Washington, Maui will host a unity march on Saturday, January 21, 2017 from 8 to 11 a.m. The march will be held at UH Maui College front lawn. Here it is on Facebook. Saturday, January 21, 2017. Mo'oheau Bandstand, Downtown Hilo, 10:00 a.m. to 3:00 p.m.
March will begin approximately 11:30 a.m. The Kaua‘i Women’s March happens Saturday from 11-1pm at the Lihue Airport intersection. The Honolulu Women’s March will begin on Saturday, January 21, 2017, at 10:00 am on the grounds of the Hawai‘i State Capitol. Registration and staging for the March on O’ahu will begin at 9:30 am on the Ewa lawn of the State Capitol. Following the march, individuals and groups will rally at the State Capitol. O’ahu organizers or the supporting organizations i.e. AF3IRM, Ceeds of Peace, Friends of Hawai'i Commission on the Status of Women, Hawaii Friends of Civil Rights, Hawai'i State AFL-CIO, LGBT Caucus of the Democratic Party of Hawai'i, Planned Parenthood of the Great Northwest and the Hawaiian Islands, Pretty Peacock Productions, Pride@Work-Hawai'i, and The AiKea Movement of Unite Here! Local 5. FAQ’s for the O‘ahu March right here.